The Melvins' new collection of covers is less of a hit than a miss. The kings of sludge play at being jester! Would it be nauseating redundancy to state that the Melvins have influenced any band of subsequent origin that has opted to tune their instruments below the key of E and further beyond? Sure it would. Despite the deserved overstatement of that fact, it wouldn’t be untruthful to say so. Kind of unwritten and slightly unsung, the Melvins’ career has been one of the most prolific in subterranean rock. Over the span of more than two decades the band has put out well over 20 records, all varying from each other, yet staying true to their incomparable sludgy, amp-melting wattage. That sound, though not conceivably imitable, has helped to spawn countless bands that take cues from the Melvins’ musical legacy. Based on this, a covers album from them seems like a bright idea. Surely, many of the fans that have deified their body of work would be more than interested in exactly which bands have been responsible for laying a cornerstone upon which the Melvins would then build upon. Though one could conceive why the Melvins doing a covers record would be a novel idea, the materialization of such just does not translate. Perhaps, knowing that they are an institution in the heavy music scene has given them artistic license to put out frivolous releases such as Everybody Loves Sausages. This album is a collection of cover versions of some of the band's favorite influential rarities. Although a half-a-handful of the songs on this are palatable, most of the record is filler that does little else but indulge the band's randomly quirky sense of humor. Not that there isn’t a healthy fan base that will add this record to their collection. Some die-hard fans will probably give this top-shelf seating and inflated praise, but the casual admirer will not likely grant this thing more than a spin or two on a turntable. Back on their 1994 album Houdini, the Melvins covered “Goin’ Blind” by Kiss and by doing so they achieved the impossible… they were able to make a Kiss song cool! However, that fantastic rendition may have set a high benchmark for the expectations of some that this album won’t come close to reaching; potentially leaving some fans a bit disappointed (such as your droog and narrator!) While tracks like the opener, Venom’s “Warhead” (a poor choice from Venom’s vast catalog, mind you), “Station to Station” by Bowie or the Jam’s “Art School” are just inherently cool and seem to have some relevancy that lies within reach of a Melvins fan’s musical scope, other head-scratchers such as “Best Friend” by Queen and a slew of others will, for some, put a post-dated expiration on the Melvins’ incessant shtick. What’s worse is that practically every song features additional musicians. 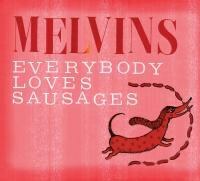 In other words, it’s not even really the Melvins (more like the Melvins and friends)! Everyone is getting in on this schlock-fest. Appearances by such all-stars as elder punk statesman/geriatric Jello Biafra and Scott Kelly from Neurosis may look real good on a promotional apparatus -- which may incur the type of curiosity that will help sell a couple of extra copies -- but it’s nothing more than padding in this case, lending very little to the overall work.